This is the year I learned how to can. I decided this would be the year mostly because our freezer is full (I think I might go buy another one today). I told my mom, my best friend, my gym buddy, and Raj. I would do it this year: learn to can. I poured over the internet, bought a few jars and some fruit and dove in. I started with some boozy cherries inspired by this great blog; if they didn't seal I could console myself by eating whiskey soaked fruit. Win. They all sealed, foiling my drunky-plan. I was standing at the farmers market one Saturday looking at the pickling cucumbers. 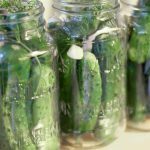 I was running through in my head: I don't need a pressure canner, I have lots of garlic and dill… will I have the time and motivation to make paleo dill pickles? I need a recipe, and I have jars. hmmm…. I didn't realize the guy at the stand was staring at me. I snapped out of my bubble and he asked if I needed help (I guess for the second or third time). No… Maybe? I just wasn't sure I would have the skill and the time. We chatted for a bit and he convinced me 10 lbs wasn't that much. He believed I could do it. Alright. I added the box of baby cucumbers to my pile and hauled it back to the car. A stranger believed in me and made a sale. I had 10 glorious pounds of potential paleo dill pickles; and no idea how. Thank goodness for Raj's mom and Cherise. Both came thru with recipes for me. Thanks to my mom and dad for finding me jars. And thanks to my roommate who has been monumentally patient about the boxes of jars and pots and fruit all over the kitchen. I feel confident now doing fruit and have some fall fruit plans, yummy pears, and apples, maybe even pumpkin; although I believe I will need a pressure canner. It's official, I have a new hobby: canning. You may be asking what makes these dill pickles “paleo”? Little did I know before reading every food label in my grocery cart, dill pickles purchased often have added sugar. One recipe I substituted the sugar with honey, which made a sweet dill- more like a bread and butter pickle. Both are good. Scary how many things have sugar in them, even savory items that you wouldn't expect, sneaking into nearly everything! I have heard that more than 80% of processed foods have added sugar. I am excited to watch Fed Up (recently out on DVD), a movie that touches on the effects of sugar and health. Have you been surprised to find sugar in a food item you didn't expect? Please share them in the comments below. A couple notes: everywhere was sold out of pickling salt when I went to make these and used sea salt instead. It seemed to work fine. The difference is dissolution rate and weight. So I used slightly more and had to stir a little longer until it dissolved into the brine. 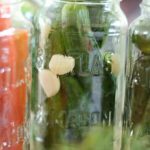 What the heck is pickling spice and do I really need it? No, you don't- well maybe… it's up to you. I needed so little that I purchased mine from the bulk food store. In the future, I think I will make my own. Have these with Paleo Tuna Salad. Tart and Dilly, these are classic dill pickles with no added sugar. 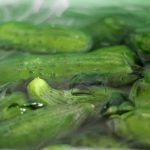 Take cucumbers, wash and put in an ice bath in the fridge overnight (Crisp cucumbers make crisp pickles- no one likes a soggy pickle). 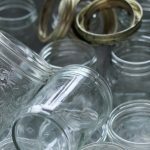 Wash and sterilize jars. Place 2 peeled cloves of garlic, one cayenne pepper (or a pinch of red pepper flakes) and a sprig of dill in each jar (if you like it spicy make a slice in the pepper). Combine water, vinegar, and salt and bring to a boil. 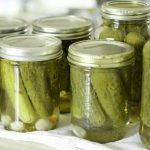 Pack the pickles into the jars, careful not to bruise them but you want the jars full or you will run out of the brine. Once the brine has boiled and salt has dissolved, pour over packed jars, and lid right away. Place in large pot and immerse in boiling water and boil for 15 min. Remove and let cool on a thick towel. You will hear the lids pop as they seal. Any non-sealers need to be refrigerated and used right away. Take cucumbers, wash and put in an ice bath in the fridge overnight (Crisp cucumbers make crisp pickles, no one likes a soggy pickle). 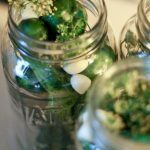 Wash and sterilize jars, place 2 peeled cloves of garlic and a sprig of dill in each jar. Combine water, vinegar, pickling spice and salt, bring to a boil. 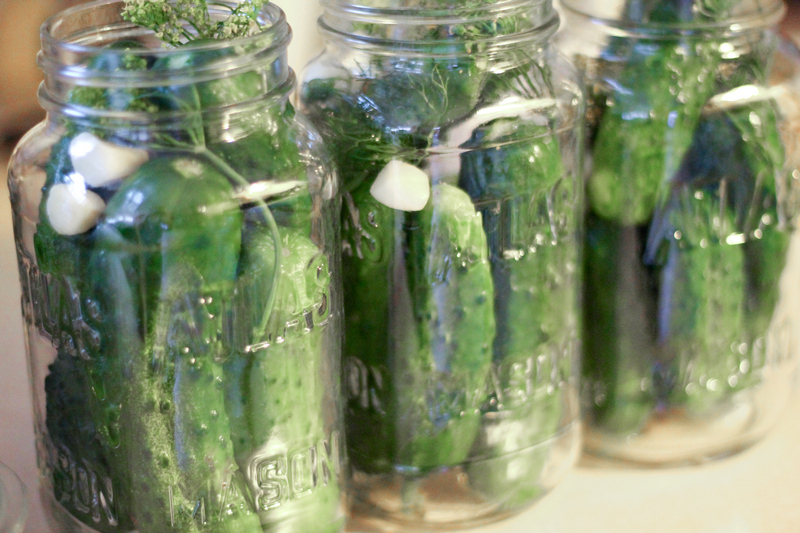 Pack the pickles into the jars, careful not to bruise them but you want the jars full or you will run out of brine. 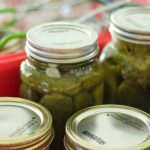 Once brine has boiled and salt has dissolved, pour over packed jars, and lid right away. Immerse in boiling water and boil for 15-20 min or until they turn slightly yellow. Remove and let cool on a thick towel, you will hear the lids pop as they seal. Any non-sealers need to be refrigerated and used right away. The most important part of pickles is the jar spank. Where you take a jar full of beans, cukes, whatever… and smack it down firmly onto your palm. It settles the contents and you can get more stuff in. Add your brine then I like to give it a less vigorous but firm tap before I recheck the fluid levels as I lift it into the canner. Because those sneaky hidden bubbles can leave your stuff high’n’dry. It has been interesting breaking down all the small but important processes and procedures I learned over time to your father now he is a kitchen partner. 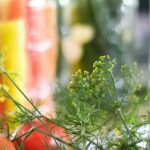 If I wanted to use pickling salt instead of sea salt, how much would I need? The very same amount! In fact, pickling salt is prefer as it doesn’t cloud. I didnt have any at the time! Let us know how it goes! Can I slice cut up my cucumbers? Mine are too large to keep whole. 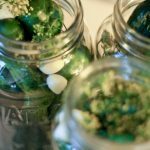 How long do the jars need to “rest” before opening? In other words, how long before the pickle are ready to eat? I had only one jar worth of cukes, and did not do the full canning process. Do I have to refrigerate the whole 4 weeks, or do I leave out until they’re ready and then refrigerate? Hi! So… I’m not sure on this, did you seal the jar? If it is unsealed I would pop it in the refrigerator. With the brine, and as long as the cukes are fully covered you are likely okay leaving it out, but I don’t know for sure… things like humidity and temperature may have an impact. Definitely agree with what you said about it being scary how many things have sugar in them! So many products have that added processed sugar to make them taste ‘better’, but in all honestly it just detriments the benefits they have on your body! Thanks for sharing your story and your recipe! Question. Your ingredients list shows “honey”, but it is not mentioned in the recipe directions. Did it just get missed in listing with adding when you add the vinegar, etc? Hi! there are 2 recipes in this post, one with honey and one without. I personally prefer the one without! I am not only pickling cucumber but eggs, onion, garlic and small sausage I a 2 gallon glass container. Can I put them all together and put them in a cool place or do Have to put them in the fridge? This is a great question! I don’t know, as I have never pickled sausage or eggs… yet. You may have to change the salt ratio but I’m sure it’s something Google would be able to tell you. I know all the veggies could go together! ANd they would be fine in a cool (dark) place. I love homemade pickles. I’m going to try your version with our cucs from the garden. Awesome! I may try growing some cucs next year for a full stem to table experience! So fun to have both of these versions! I bet they’re both delicious. Homemade are the best! I agree! 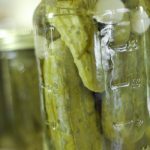 All about the homemade pickles! Sugar, and even more surprising, the vast majority of popular brands add food dye too….YACK!!! Boggles the mind! I’ll take your version any day!! OMG, I forgot about the sneaky food dye!!! It is terrible for us too! I was reading a study on dye and ADHD. Thanks for the reminder! This is so fun Holly! Good for you enjoying canning! I have not gotten into it as much as I would like but this inspires me! Thank you! I’m mouth-water just thinking about it. 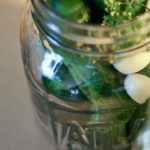 Love homemade dill pickles ! Bring on the drool and the homemade summer bounty! Oh heck yes! Plus some pickled garlic and maybe some carrot dipped in hummus… drool city population me…. I am obsessed with dill pickles- thank you! Here too! All the dill everything and pickled veggies! It’s crazy how many things have sugar in them! We have a couple brands available here that don’t have it which is nice, but I’d love to try making my own sometimes! Right? Sugar is in everything! I have never made homemade pickles before. I didn’t know it was so simple. Such a great idea. It really is easy, and you don’t have to can them either! I’m not usually one for pickled foods but this is something I’d like to try, thanks for sharing!